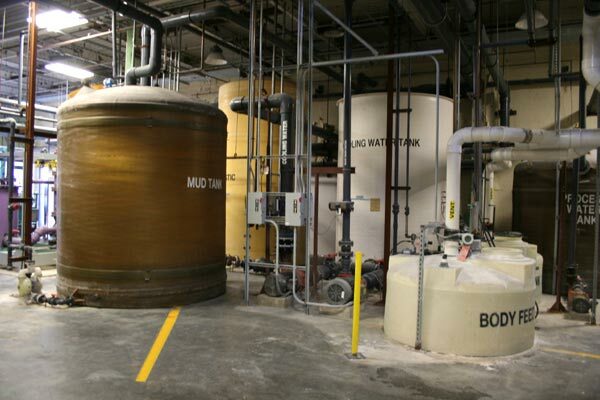 Borden & Remington is a pioneer in the chemical manufacturing of aqueous ammonia solution. Product is brought in by rail and is blended with deionized water to manufacture a chemical product that can be sold for ultra sensitive applications. The ammonia is then shipped to various customers for a multitude of applications. The aqueous ammonia production facility ships the bulk of this material by truck to power plants for NOx emissions reduction. Then remainder of this product is distributed to many industrial and municipality users via truck, tote, or drum quantities. In 2003, a decision was made to invest $2.5 million to purchase and install equipment to enter into the Sodium Hypochlorite chemical manufacturing business. This decision was made through much thought and strategic planning. In examining the current sources of supply, it was decided that it made no sense to just supply the chemical product as a commodity chemical as others. It was discovered that bleach-bottling customers were buying filtered bleach product from New Jersey for use in New England. The decision to purchase a continuous bleach chemical manufacturing system with a titanium filter would separate Border & Remington Corp. from other suppliers in the New England region. The chemical company found its niche and positioned the sodium hypochlorite product to fulfill this demand. Another advantage to this chemical product is that it would incorporate a raw material that was currently purchased and stored in Fall River, MA. This decision was sensible due to the fact that the company was already bringing in shiploads of Sodium Hydroxide, which is one of the raw materials used in the processing of bleach. Also, after the examination of suppliers in the area and demand through municipalities, pool chemical suppliers, and industrial laundry users, it was determined that there was a need for this chemical product. The National Sanitation Foundation (NSF) registers the aqueous ammonia, potassium hydroxide and sodium hypochlorite products.